Some things don’t change. The monks who came here in 1132 were pretty good at amassing money too. Thirteen Benedictine monks left St. Mary’s Abbey in York to found a Cistercian Abbey in this valley. It became one of the richest in Europe. Something that has changed, since my last visit, is the approach to the park. You used to be able to drive into the estate through the deer park, but traffic now is all routed via the Visitor Centre. Pick up a map at reception, and let’s go. 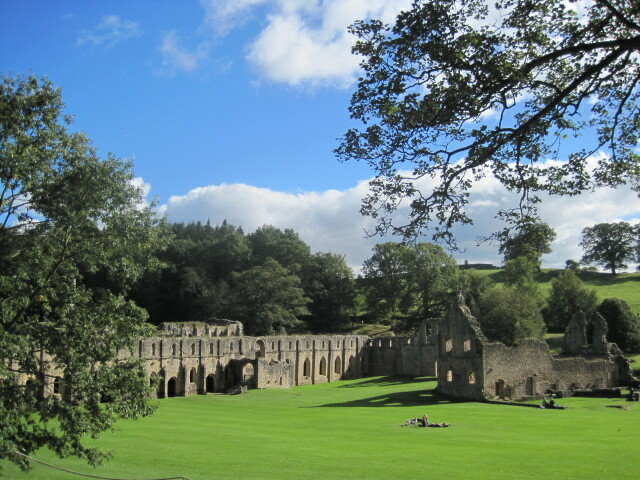 The ruins are extensive and Fountains Abbey Mill is the only 12th century Cistercian cornmill left in the UK. It was in continuous use until 1927, and today houses an interactive exhibition and the water wheel, which can still grind corn. If you’ve never been here before, you will almost certainly be impressed with what comes next. 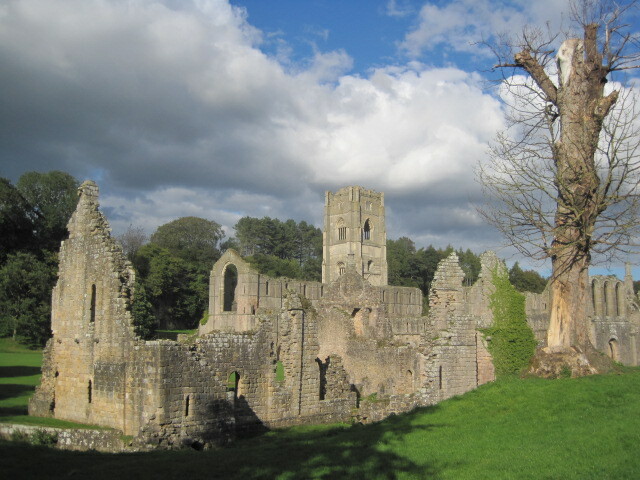 After the dissolution of the monasteries in 1539, the Abbey buildings and over 500 acres of land were sold by the Crown. 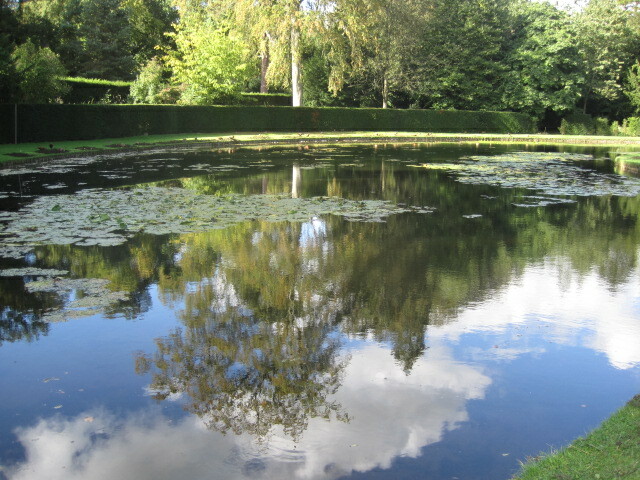 The property was passed down through several generations until it was inherited by John Aislabie, in 1693. He was a socially and politically ambitious man and became Chancellor of the Exchequer in 1718, but his involvement in the South Sea Bubble financial scandal had him expelled from Parliament. 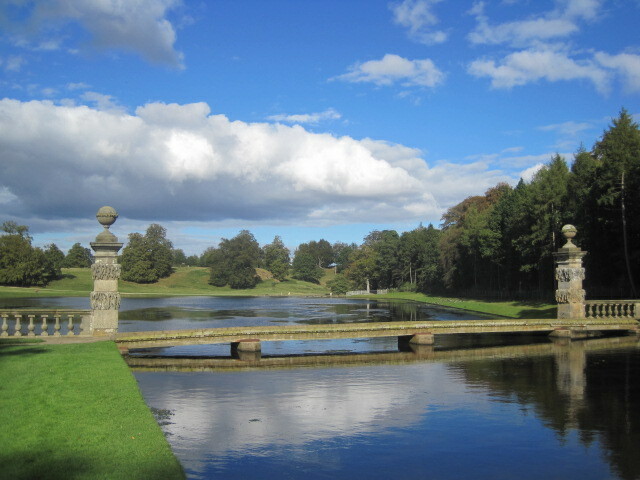 On his return to Yorkshire, he turned the wooded valley of the River Skell into one of England’s most spectacular Georgian water gardens. A group of volunteer gardeners are raking pond weed from the canals- a pleasant enough occupation on such a sunny afternoon. 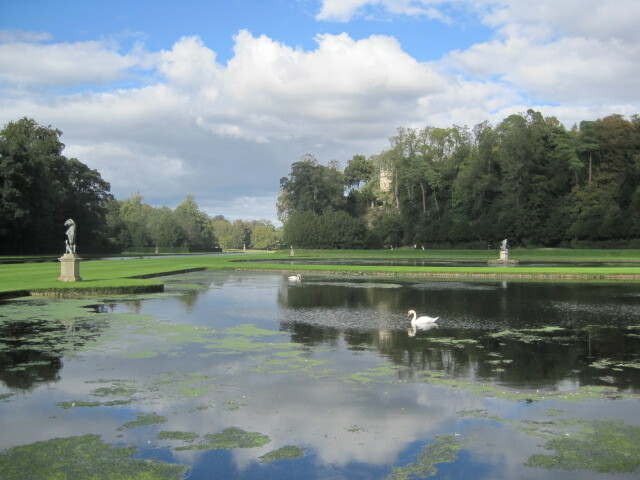 The curve of the Moon Pond stretches ahead, the pillars of the Temple of Piety a focal point on the far side. Originally the Temple of Hercules, it is believed to have been renamed when John Aislabie’s son, William, commissioned a bas relief wall sculpture inside the temple, after his father’s death. You need to walk along the canal and cross over a narrow bridge to reach the Temple of Piety. From the bridge there’s a good view across the lake to the deer park. I didn’t spot any deer at that distance, but was diverted by one of the park’s follies, the Octagon Tower. A neo-Gothic castle, it looked to me very inviting, but sadly I couldn’t climb it. Beneath it lies a Serpentine Tunnel, originally designed to give people a bit of a fright at garden parties. I’m not sure what she was holding? I couldn’t climb the tower, but I did find somewhere to look down onto the park. A sign directing me to Anne Boleyn’s Seat and Surprise View could not be ignored. I’ll spare you the climb because it was pretty steep, but I think you’d like the view. You will have an advantage over Anne Boleyn, who never actually saw it. That’s not because she didn’t have a head, but the name does come from a headless statue. Back on the path, you can return along the opposite side of the canal, steadily approaching the Abbey. There you will have a number of diversions. 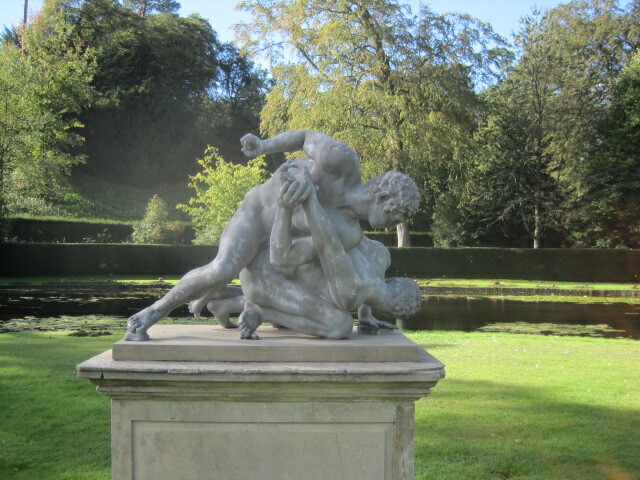 You can visit the Mill or the tea rooms, and Fountains Hall is a stately exhibition space. (with holiday flats to let!) Any children with you will love the interpretation centre at the Porter’s Lodge. (I did too!) And if you have time and energy to spare, there’s the Gothic extravagance of St. Mary’s Church and a stroll round the deer park. Don’t take my word for all this. The National Trust website will tell you the whole story and provide instructions on how to get there. I think that you would enjoy this World Heritage Site. I know I did. And now it really must be time to put the kettle on, don’t you think? Click on the logo to visit my Jo’s Monday walk page for details on how to join in. As always we have a wonderful variety of walks to share. Amazing landscaping…. about that sculpture that is holding something in her/his hands. Are you sure it is a female? I think you/we got our money’s worth. What a marvellous walk. That’s one way to look at it! 🙂 🙂 The grounds are truly beautiful, Ann, and the weather gods were definitely on my side. Hi Pauline 🙂 Yes, I got it ok! Many thanks! Hi Yvette 🙂 I still haven’t managed a ‘Joy is’ 😦 😦 It’s on the list 🙂 Happy weekend to you! More excitement! 🙂 🙂 Thanks a lot, Jill. I’ll be right over! Just off to cook tea so will read yours shortly. Weather pretty decent – had a couple of rainy nights with thunder and lightning and yesterday was very windy. Lunch at the beach in a rainstorm was fun (we were indoors), and hit a couple of thunderstorms driving home today, but otherwise good. such beautiful and amazing story and the images makes it live! It’s easy to tell the story with views like that. 🙂 Thank you for your kind words. Welcome back, Madhu! Did you have a fantastic time? Funny, I thought just this morning- I wonder when Madhu’s back? I bet it went quickly for you! Umm I imagine you are not if you didn’t notice that!!! 😀 Thanks Jo. Yes, it seemed to fly by! 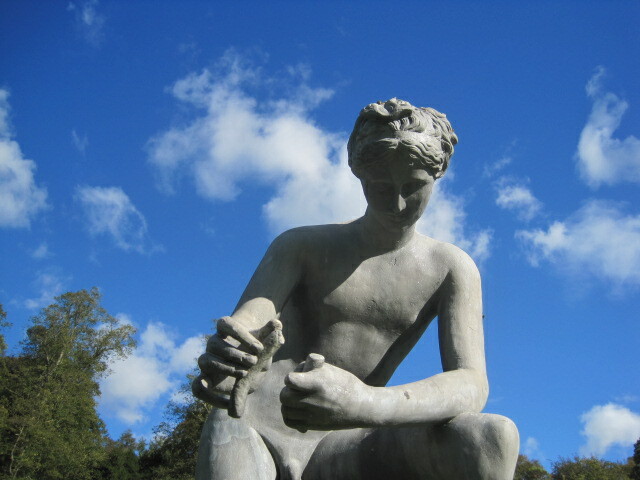 It is a statue of Galen and HE (yes it is a he – look at your first image) is probably holding arteries in his hands as his most important discovery was that arteries carry blood although he did not discover circulation. Oh, I say! What a dreadful cheat 🙂 🙂 I should have too! I have never been to England, but this is exactly how imagine English countryside to be. Your beautiful photos reminded me of a movie I saw many years ago: “Sense and sensibility” with Emma Thompson. The scenery in the movie looked almost the same as the landscape in your post. Thank you Jo for taking us to this wonderful place. Big thanks also for featuring my walk in the Finnish nature. It is very kind of you. Looking forward to your next Monday’s walk. You’re very welcome, Vasilis. 🙂 It’s fascinating to amass posts from around the world and see the differences in where people ‘walk’. I’d love a Greek one from you. 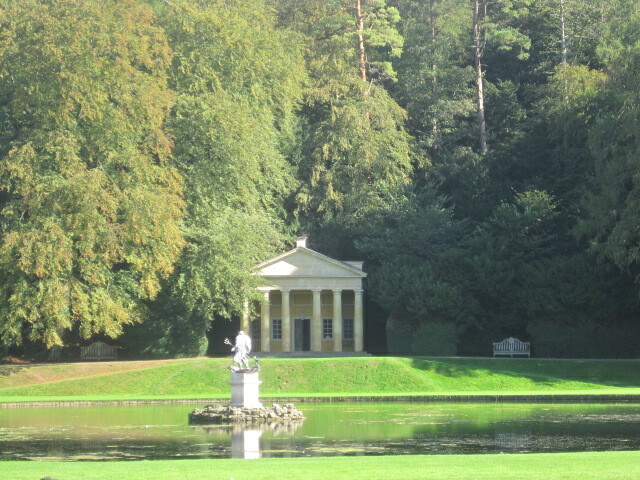 Yes, Studley Royal is most definitely Jane Austen territory. She lived not too far away from there. 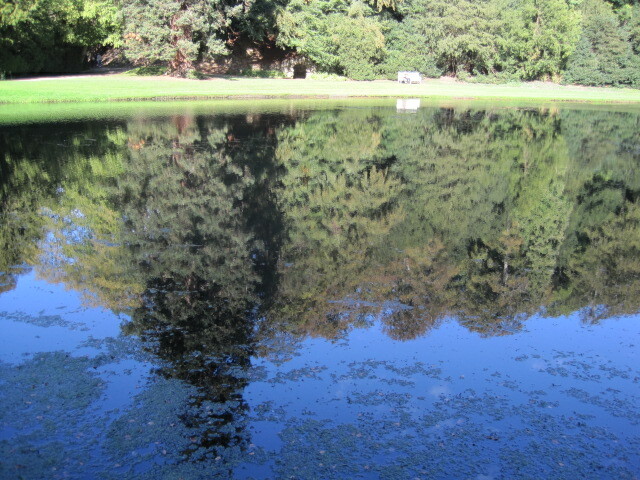 I can just imagine striding around that park with you, snapping away, Cathy! That would be such fun. 🙂 I don’t know the other but I’m not very familiar with the Cotswolds. Happy days! 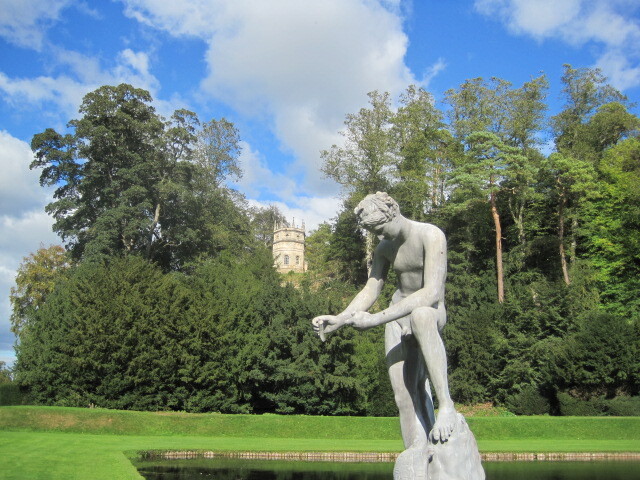 There is a fountain and gardens in the Cotswolds near Cheltenham, but it is called Stanway – is that the one you visited? Will be blogging about it soon, when I find the time. Already have 100’s of photos!!!!! Anne Boleyn’s Seat is by far the most unusual viewing station I’ve ever seen.